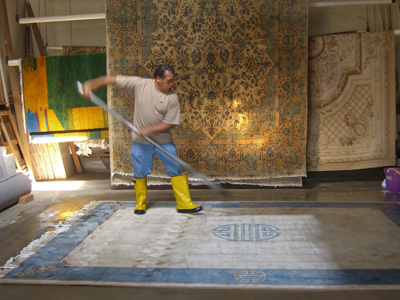 Honar Rug Restoration and Cleaning has been serving Montgomery County, MD since 1990. Oriental carpet cleaning experts with pickup in Potomac, Bethesda, Chevy Chase, Rockville, Silver Spring and other cities in Montgomery County. We specialize in complete Oriental rug service. We will treat your rugs with new Dye, Redye and Discoloration removal. Contact us for Oriental Antique Rug Appraisals, Moth Protectors and Padding. Come to our showroom for a large supply of oriental rugs from Persia, China, Turkey, Afghanistan, and Pakistan, as well as Antiques and Collectables. We are located in Rockville, Maryland, and provide service throughout Montgomery County, MD including Bethesda, Chevy Chase, Damascus, Gaithersburg, Germantown, Kensington, Olney, Potomac, Silver Spring, Somerset, Takoma Park, and Wheaton.